After a turbulent and ultimately unsuccessful trip to Australia, Red Verdon has had his attentions switched to the Hong Kong Vase, set to be run at Sha Tin racecourse. He touched down in Hong Kong earlier this week and is now working towards the race on Sunday the 9th December. It is easy to get disheartened by how things worked out Down Under, but there were other connections that made the journey over and suffered much worse luck than us. Although the axe fell at exactly the wrong moment in terms of the Cup, and our luck in the Caulfield Cup could have been better, Verdon was never seriously injured and has bounced back quickly. With his owner Ronnie Arculli being a Hong Kong native, it was always the plan to try and have a tilt at the Hong Kong Vase on the way home - a race that we won for the same connections with Red Cadeaux back in 2012. Just over a week out from this year’s race and a repeat of those heroics looks like a tall order, but we will be trying our very best! Waldgeist sets a stern standard judged on his Gr.1 winning form earlier in the year, whilst the mercurial but gifted Pakistan Star leads the home defence. Latrobe is an Irish Derby winner and confirmed his wellbeing with a super run in Australia, whilst Mirage Dancer beat us by three and a half lengths earlier in the year at Goodwood. Salouen ran another fine race in the Arc, and Prince of Arran looked a new and improved horse when winning the Geelong Cup and finishing third in the Melbourne Cup in Australia recently. 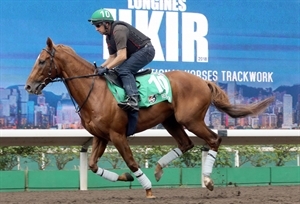 Getting in amongst that calibre of opposition is going to be a big ask, but we just have to hope that Red Verdon can find a few pounds of improvement for competing in Hong Kong, and can return to his peak form of midsummer. The picture attached is a brand new one, and we think you will agree that he looks in fine fettle, so we keep our fingers crossed!